Ignacio Estrada said that “If a child can't learn the way we teach, maybe we should teach the way they learn.” I strongly take this in. I believe that a teaching philosophy is all about how a student can better understand. A classroom should be a place where children feel they can be themselves. I don’t want any student to feel uncomfortable to ask a question. There is no such thing as a dumb question, only an unanswered one. The classroom is an importance place of consistency and organization. Teaching children how to manage their time, organize their work and maintain a constant routine and a schedule are substantial qualities in life. A classroom should be a place where kids feel free to have fun and express their ideas. The classroom is also the primary place for me to set an example in healthy life habits, such as: washing your hands, using good manners, and eating healthy foods. I am not an effective teacher if I do not learn from, and change, my teaching methods through my experiences as a teacher. Every student is different. The key is finding a way to teach all my students effectively. Different learning styles, different approaches. A variety of experiences in the classroom make learning fun and interesting. There are many ways to teach a concept or area, I must capitalize on all resources and manipulatives available. Technology, especially in the classroom, is ever-changing and we all have much to learn from it. My students, as young as they may be, will possibly know more about computers then I do by the time they reach my class. It is important to be open-minded and willing to learn from my students. I never want to be stuck in “the old way of teaching,” I want to make use of all technologies readily available to me. Communication of today makes it easier to communicate with students and parents. I hope to tap all resources available, and convenient, to parents and students. So much can be accomplished through simple communication technologies. I have Christian values and believe in “loving people.” Patience is a huge part of being a teacher; I believe it is important to be calm and listen to what my students have to say. Everyone is important. We must take opportunities to help serve others; as well as respecting others. God wants us to help take care of each other and what he has provided for us. I also strongly believe in recycling and doing what we can for our earth. These students are our future, we must teach them to respect the earth as well as each other. I want my students to leave class yearning to learn more and striving serve others. I want them to feel positive and empowered about themselves and what they are capable of doing. Continuously, I want to be open to change and new learning experiences headed my way. For the first two years that I attended this school I was in an honors program called "Cornerstone." 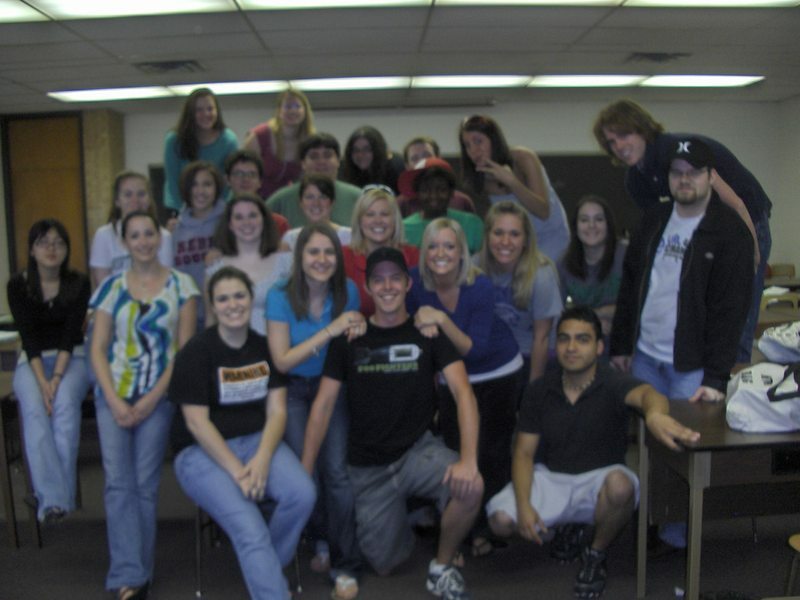 I was around the same thirty people for the majority of my classes; it was a wonderful experience. I learned a great deal about other people. I would not change the expirence for the world. It was in this program that I decided to change my major from social work to education. Joh Mayer "Stop This Train"
I have worked with Word, PowerPoint, Access, and Excel for about 8 years. In Fall of 2008 I took a class on Office 2007 and learned many vauable skills.